Will Rodman (James Franco) is a scientist, currently residing in San Francisco, who is working on a cure for Alzheimer's Disease by performing tests on apes. The first test subject is a chimpanzee, named Caesar (Andy Serkis), whose parents had been captured in Africa. Rodman's "cure" not only repairs brain cells as they expected to, but it genetically modifies Caesar's way of thinking to create a new breed of ape with human-like intelligence. Caesar learns unbelievably well, but human authority orders him to be locked up. However, he eventually proves to be smart enough to escape from his cage and releases an airborne-strain of the cure among thousands of other apes (the ones that are caged with him), making them as intelligent as Caesar. Thousands of apes begin to foment revolution. 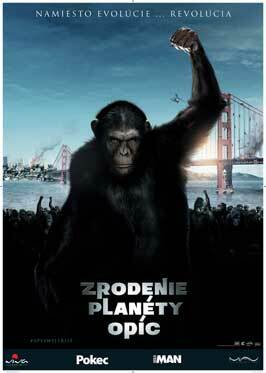 Soon, war breaks out between humans and apes. Rodman may be the only one able to stop them before the ape revolution ends with the apes succeeding, humanity being driven to extinction, and apes becoming the most dominant species on Earth. After releasing online the teaser clip for Rise of the Planet of the Apes that was unveiled at the recent San Diego Comic-Con, a clip that contained more ape action than any of the previous clips or trailers, Twentieth Century Fox has just unleashed more preview clips containing even more apes causing mayhem. Directed by Rupert Wyatt (The Escapist), Rise of the Planet of the Apes is a "reality-based cautionary tale" about the possible pitfalls of monkeying (sorry, couldn't resist) around with genetics. James Franco stars as Will Rodman, a scientist who discovers a cure for Alzheimer's disease that, when tested on apes, grants them intelligence on a par with humans, giving rise to a veritable army of super-smart, super-ticked off apes.